When it comes to the iconic medieval warrior, steel armour is what everyone pictures. Or more specifically, they envision a gleaming warrior covered from head to toe in plate armour. And at Medieval Armour, we offer a massive of variety of steel armour, ranging from full suits of armour to the various pieces of medieval armour that a warrior can wear into battle. In our steel armour section, you'll find just about everything you need to put together a full and cohesive suit of traditional medieval armour. What this means is that you'll find steel body armour, steel leg armour, steel arm armour, steel gorgets, and more, all geared towards allowing you to mix and match your favorite steel pieces to create your ideal suit of knights armour. Of course, we don't just offer everything piecemeal. 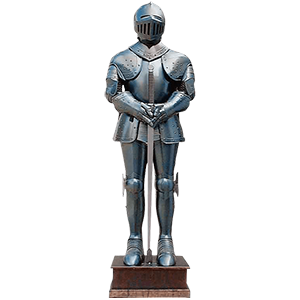 We also offer steel suits of armor that are pre-assembled and containing virtually everything you need to either equip yourself with impressive war gear or put up one heck of an armoured decoration. Steel armour makes for great reenactment armour and SCA armour, providing a solid defense against strikes and blows from a variety of weighted and blunted weapons that are typically used when reenacting battles. And because of its strength and its intimidating look, steel body armour also makes for great LARP armour, where it will transform anyone into an impressive looking warrior. A few pieces of steel armour will keep you safe and secure, while a full suit of steal armour will make you feel invincible and look incredible. 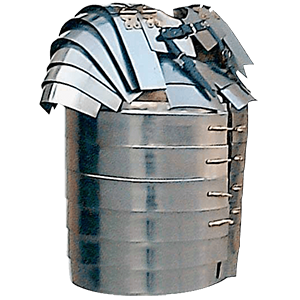 So now that Medieval Armour has your attention, why not take a moment to browse through our incredible selection of steel armour? You never know what you might find, whether it's the perfect suit of reenactment armour, that steel arm armour you've been craving, or even just a wickedly awesome suit of armour to stand in your entry hall that will make all your guests stop and say 'wow'. If you're going for the total package of a completely armed and armoured look, then you won't want to march into battle without wearing a good pair of medieval pauldrons. And of course, Medieval Armour is your number-one place to find all the steel pauldrons and steel spaulders you need to provide perfect protection to your shoulders and upper arms. Of course, upper arm armour like this doesn't just provide protection, but also an added level of impressive style that enhances any armoured look. As far as medieval armour goes, our pauldrons come in a few different designs, featuring a shining steel that's typically associated with knights pauldrons and gothic pauldrons, as well as the darkened steel pauldrons that typically go well with intimidating and dark warrior looks. Of course, being made from quality steel, these pieces of medieval armour are perfect for use as SCA pauldrons, where they will provide that much-needed added layer of defense. Some, thanks to their sword-breaker attachments, might even catch and ruin an opponent's blade, and that's always a good thing! They also make fantastic LARP pauldrons, where they'll give you a realistic, armoured look that will actually fend off and lessen the impact of padded or blunted weapons. It should be noted that some pauldrons do require a gorget or a cuirass to wear, so please read the description of your pauldron of choice carefully. Tie in a pair of steel spaulders or steel pauldrons to your armoured appearance, and you won't have to worry about errant strikes clipping your shoulder or taking your arm off (metaphorically speaking) ever again. Sometimes a warrior doesn't want or need to cover himself in layers of thick, heavy steel. Sometimes, a bit of steel is all the protection you'll need. 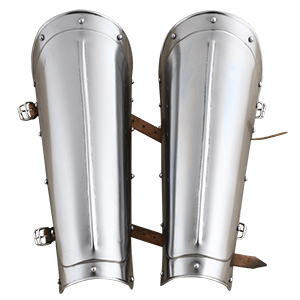 And for those situations, Medieval Armour offers a number of steel arm bracers, which are perfect for providing not only a touch of protection on the arms, right where you need it, but also a bit of authentic medieval style. We offer a range of steel bracers in a variety of styles, ranging from authentic medieval arm bracers modeled after pieces of medieval armour to impressive and stylish fantasy bracers that are drawn from the creative realm of fantasy and imagination. Being functional steel armour, these bracers are ideally suited as SCA arm bracers, where they'll stand up to the punishment that is typically delivered to any piece of armour on a regular basis. Of course, because of that strength, they're also a fantastic piece of LARP armour or reenactment armour, enhancing the look of any costume while providing a touch of protection, as well. With these arm bracers, you're not even really limited by era, as Roman arm bracers, knightly arm bracers, and even elven arm bracers all look fantastic with a wide assortment of different styles. 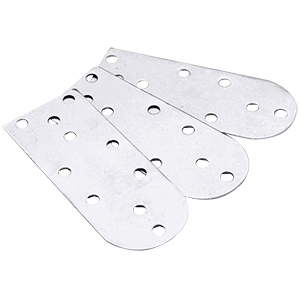 Basically, you can take any of the steel arm bracers you'll find here at Medieval Armour and mix and match them with your favorite costumes and suits of armour, creating many looks that are great for show and for use. For total hand protection, you need a pair of steel gauntlets from Medieval Armour. With these metal mitts, your hands will be almost impervious...and yet, because many of our medieval gauntlets are articulated, you'll also retain most (if not all) of your dexterity, allowing you to continue wielding your weapon with all the skill of a trained fighter. 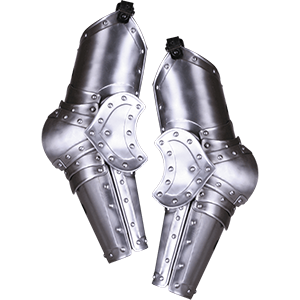 A good pair of steel gauntlets will take you far, while providing a classic touch of medieval armour that belongs on any medieval warrior or knight. Here, you'll find several sets of knight's gauntlets, some in gleaming steel, others embossed for detail, and others still blackened for intimidating effect. All of metal mitts featured here are articulated gauntlets, which ensure that whether they're actual mitten-style hands or fingered, you'll retain the use of your hand when you wear them. 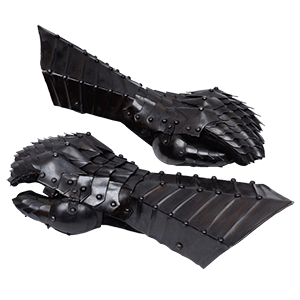 Each set is fully functional and makes for great SCA gauntlets, providing more than adequate hand protection when worn that's capable of turning away glancing blows with ease. For that reason, these pieces of medieval armour are also as effective as LARP armour as they are as reenactment armour. 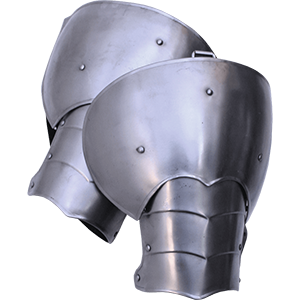 At Medieval Armour, you can find just the steel gauntlets that you need, whether you're looking for Italian Milanese gauntlets, classic knight's gauntlets, or even German gothic gauntlets. If you think that, after donning a cuirass, greaves, bracers, pauldrons, and a helmet, you're fully armoured, then think again! Your upper legs are still open to attack. Don't worry, though, because Medieval Armour offers the perfect remedy for that, in the form of our steel thigh armour, which can consists of cuisse, tassets, or even groin plates! Thigh armour comes in several different forms, although the most common form of thigh armour found here in this section is the tasset. This piece of functional leg armour consists of a waist belt that suspends overlapping armoured plates that defend the upper legs and waist from attack, providing a more than adequate level of upper leg protection. Thigh armor can also consist of other pieces of leg armour, though, including the cuisse, which is similar to greaves, but is instead worn on the upper leg and thigh. 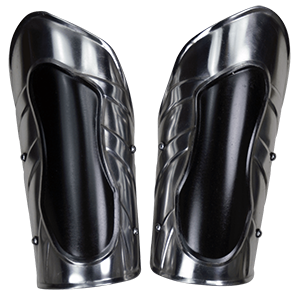 The steel tasset and the steel cuisse can even be combined, to provide protection from both downward attacks and the occasional upward strike from the ground! Being made from steel, this medieval armour is fully functional, which means it works wonders as a piece of SCA thigh armour, providing just the right level of defense that will help turn away stray blows and strikes from what could normally be a difficult area to defend. Because of that strength, these medieval cuisse armours and tasset belts are also fantastic LARP armours, making it much harder for a live action roleplay opponent to slip a blade past your steely defenses. Are you looking for leg protection but don't know where to start? 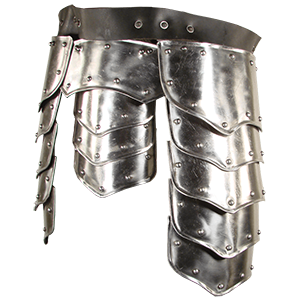 Luckily, you've found the right place, as Medieval Armour has an assortment of steel thigh armour to work with, ranging from fitted steel cuisse to the ever-important and impressively defensive tasset belt. Even a warrior that values mobility in combat has to evaluate the danger of leaving one's legs unprotected in battle. All it would take is one luck strike before that mobility is gone. That's why, at Medieval Armour, we offer a wide assortment of steel full leg armour, because even if leg protection slows you down, it's worth it to have the added defense. Our steel leg armour comes in a variety of different styles and consists of a variety of different pieces, just like actual medieval armour did, centuries ago. Virtually all of our medieval leg armour consists of a cuisse or thigh armour of some kind, providing protection to the upper leg. Most also extend down over the knee, protecting this important joint, before ending along the lower leg. As well as our full leg armour, which covers the whole leg, we also offer 3/4 leg armour, which covers most of the legs and requires only an added set of functional greaves to provide complete and total leg protection. 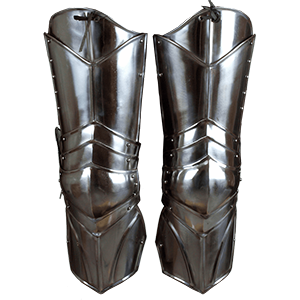 As they are made completely from steel, these sets of medieval leg armour are also fully functional armour, making them an ideal set of SCA leg armour or LARP leg armour, providing all the protection your legs need to shrug off a blow from a padded or heavy foam weapon, while also preventing serious injury from a blow dealt by a blunted sword or training blade. If you're not one-hundred percent sure that your legs won't come under attack (and really, how could you be?) then a good set of steel full leg armour from Medieval Armour is just preventative planning at its best. 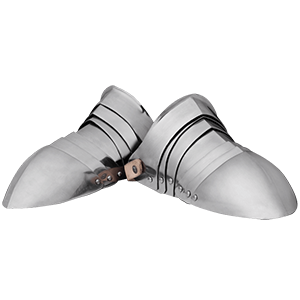 Sabatons are foot armour used throughout the Middle Ages and into the early Renaissance. Typically, sabatons were not worn by foot soldiers but instead protected the feet of mounted fighters. This foot armour would primarily defend the top and sides of the foot. At Medieval Armour, our steel sabatons are great for LARP and reenactment use. Our sabatons are typically sold as a pair and are made of hinged strips of steel with leather straps for flexibility while fighting. Most are designed to be worn over shoes or boots. For a comprehensive armoured look, you cannot forget the feet! Shop all our steel sabatons here. These Steel Armour Packages are a great way to make putting together a full suit of armour easy and hassle-free. 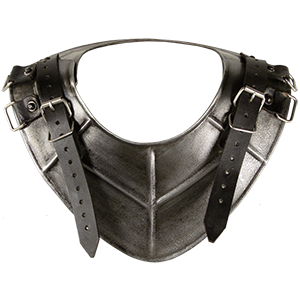 Each and every steel armour package offered here at Medieval Armour contains a few pieces of armour that go a long way towards enhancing not only your medieval or fantasy look, but also enhancing your personal level of protection in battle. Some of our armour sets, like our Black Ice Complete Armour Set and our Conquest Armour, include all the essential pieces you'll need to gear up and charge into battle, creating a full suit of armour that lacks only a padded under-layer and any clothing you might wish to wear underneath. Some sets include more than others, offering varying amounts of protection that range from total coverage to armouring just your chest and shoulders to armouring just your legs and arms. It all depends on what the armour set includes. These steel armour packages are fully functional, containing only battle ready armour that is designed to take a hit and keep on going. For this reason, these suits of armour are perfect sets of SCA armour and LARP armour, where they'll truly excel in keeping their wearer well-defended against all manner of strikes, attacks, and blows. 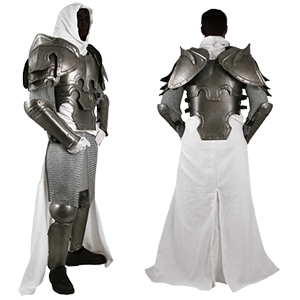 As with any full suit of armour, a gambeson or heavy shirt is recommended for added padding and wearer comfort. We've got at least one awesome set of knights armour, if not more, here for you at Medieval Armour, and it's just waiting to be taken out and worn to a renaissance fair, a theater production, a LARP event, or even an SCA fight (although given SCA's strict rules, it's best to check with your local chapter for approval beforehand).